Character. Cost: 5. STR: 4. 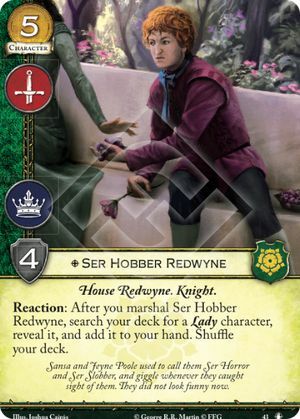 Reaction: After you marshal Ser Hobber Redwyne, search your deck for a Lady character, reveal it, and add it to your hand. Shuffle your deck. Sansa and Jayne Poole used to call them Ser Horror and Ser Slobber, and giggle whenever they caught sight of them. They did not look funny now. This guy is average, he gives you a cantrip when you play him, but unless you have a lady you wish to dupe, chances are you cant afford to play that lady this turn, unless you use To the Rose Banner!, which is then getting you negative card advantage. the other use is to get a lady to play next turn with the chance it might get intrigued out of your hand or heads on spikes.